Rivalry between French and Italian interests in Tunisia culminated in a French invasion in 1881 and the creation of a protectorate. 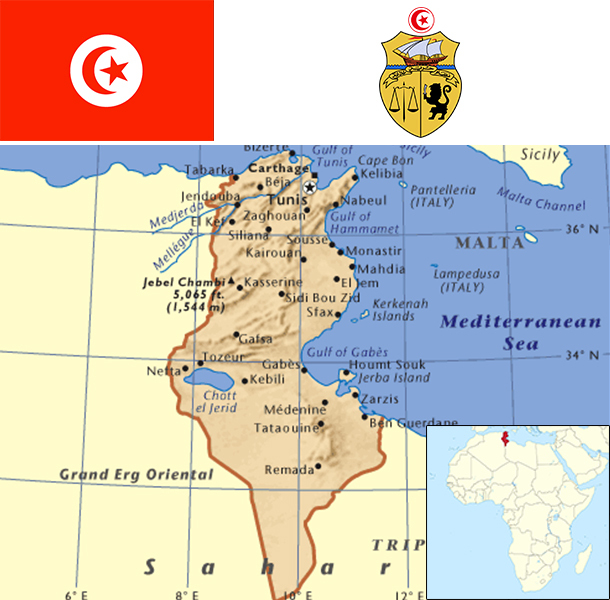 Agitation for independence in the decades following World War I was finally successful in convincing the French to recognize Tunisia as an independent state in 1956. The country's first president, Habib BOURGUIBA, established a strict one-party state. He dominated the country for 31 years, repressing Islamic fundamentalism and establishing rights for women unmatched by any other Arab nation. In November 1987, BOURGUIBA was removed from office and replaced by Zine el Abidine BEN ALI in a bloodless coup. Street protests that began in Tunis in December 2010 over high unemployment, corruption, widespread poverty, and high food prices escalated in January 2011, culminating in rioting that led to hundreds of deaths. On 14 January 2011, the same day BEN ALI dismissed the government, he fled the country, and by late January 2011, a "national unity government" was formed. Elections for the new Constituent Assembly were held in late October 2011, and in December, it elected human rights activist Moncef MARZOUKI as interim president. The Assembly began drafting a new constitution in February 2012 and, after several iterations and a months-long political crisis that stalled the transition, ratified the document in January 2014. Parliamentary and presidential elections for a permanent government were held at the end of 2014. Beji CAID ESSEBSI was elected as the first president under the country's new constitution. Tunisia's diverse, market-oriented economy has long been cited as a success story in Africa and the Middle East, but it faces an array of challenges following the 2011 revolution. Following an ill-fated experiment with socialist economic policies in the 1960s, Tunisia embarked on a successful strategy focused on bolstering exports, foreign investment, and tourism, all of which have become central to the country's economy. Key exports now include textiles and apparel, food products, petroleum products, chemicals, and phosphates, with about 80% of exports bound for Tunisia's main economic partner, the European Union. Tunisia's liberal strategy, coupled with investments in education and infrastructure, fueled decades of 4-5% annual GDP growth and improving living standards. Former President (1987-2011) Zine el Abidine BEN ALI continued these policies, but as his reign wore on cronyism and corruption stymied economic performance and unemployment rose among the country's growing ranks of university graduates. These grievances contributed to the January 2011 overthrow of BEN ALI, sending Tunisia's economy into a tailspin as tourism and investment declined sharply. During 2012 and 2013, security and political upheaval during transition led to a deterioration of the economy and resulted in several downgrades of Tunisia’s credit rating. Tunisia's government faces challenges reassuring businesses and investors, bringing budget and current account deficits under control, shoring up the country's financial system, bringing down high unemployment, and reducing economic disparities between the more developed coastal region and the impoverished interior.